Absolutely fantastic! The accommodation was beautifully thought out and clean (and warm! ); wonderful big lounge area and kitchen dedicated for us (guests); lovely big garden with beautiful countryside views in all directions; and breakfast was a delicious feast that would rival most! I was travelling with my 2 very young children (1 and 4 yrs), my brother and his young daughter (2yrs) and my grandfather aged 90 - we all loved it! But most of all thank you to Miv and John who could not have been more friendly and accommodating. We had a lovely stay and will definitely be back as soon as we can! Great location and lovely accommodation. Perfect for a combination of aged grandparents and enthusiastic and energetic toddlers for a family get together. Super comfortable, incredibly accommodating hosts with all our different needs and requirements and excellent slap up breakfasts! Will definitely use again. Better than home away from home. A beautiful, luxurious place to stay. Travels this spring and summer took me from the New Forest to London to Disney World in Florida to St. Maartens in the Carribbean to Sharpsburg, Georgia and up and down the eastern seaboard of the United States. Without doubt, the best lodging of the entire trip was at Ridgeway Lodge. It is comfortable, attractive, and welcoming. John and Miv treat guests like family. It is my favourite accommodation worldwide. Gorgeous accommodation and a very friendly welcome made this a perfect spot to spend two nights on our Ridgeway Walk. Located with easy access to Princes Risborough and the Hellfire Caves at West Wycombe. A very comfortable, quiet and restorative place, charming hosts and excellent food. Would not hesitate to return. Great place to stay. You are made to feel very welcome and nothing is too much trouble. Food good, beds comfy and everywhere immaculate. We would definitely stay again. 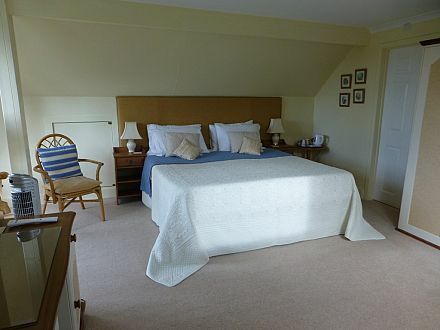 Ideal for relaxing stay,with first class accommodation in a friendly atmosphere with a breakfast to set one up for the day, Transport or good walking boots are required due to the location which is set on the edge of the Chilterns. Mum and I have just stayed at Ridgeway Lodge for the second time. Once again it provided us with a superb base while visiting family and friends. Miv and John are very friendly and ensure that everything needed for a perfect stay is provided. The lodge sits in a beautiful garden with wonderful views, the beds are really comfy and the breakfasts delicious! It is exceptionally clean and tidy. Ridgeway is an absolute delight and Miv could not have been more welcoming, friendly or accommodating. I had previously looked at Ridgeway but was put off by the room not having an en suite bathroom. As a result I stayed somewhere else which was awful. On my second visit to the area, I decided to try Ridgeway and was (a) thrilled I had and (b) furious I had forsaken it on the previous trip. I would not hesitate to recommend Ridgeway for either a single traveller, two singles, or even a small family group. I have already planned to return with some of my family and if I have to return to the area for business again, Ridgeway is my destination of choice! Very handy when walking the Ridgeway. 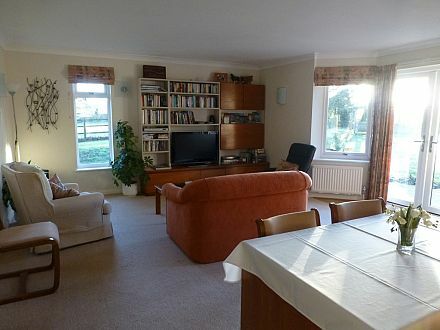 Lovely spacious accommodation, ideally suited to a small group, with kitchen and lounge area. Very comfortable and welcoming. My husband and I, and our two sons (aged 2 and 4) stayed at Ridgeway Lodge for one night. We received a very warm welcome and were delighted by the facilities which were modern, stylish, comfortable and spotless. Breakfast was absolutely delicious and we all enjoyed our stay enormously. We left our son's library behind and Miv very kindly posted it back to us. We would definitely stay there again! Very nice accommodation and extremely helpful hosts. Stayed with my husband and daughter for one night whilst visiting the hearing dogs centre nearby. We received a warm welcome by the owners, Miv and John with coffee/tea and cake offered on arrival. We stayed in the ground floor rooms which were very stylish and comfortable with everything we needed. We utilised the kitchen and lounge room, this is a real bonus feature of this accommodation. Breakfast was scrumptious, with home made jams & marmalades, fruits, cereal and a full English to boot. The grounds of the lodge look beautiful and the surrounding area is quite rural and peaceful. This is a great base for walkers or for those who wish to visit local places of interest. Ridgway lodge is a first class B&B & we would definitely stay again. We stayed at Ridgeway Lodge whilst following the Ridgeway route (but not walking it due to an injury) the house is just on the path which is very convenient. The hosts Miv and John were very friendly and welcoming and immediately offered us homemade lemon drizzle cake and tea. The room was immaculate with a beautiful new shower room and had everything we could possibly need. It was very nice to have the opportunity to use the kitchen to cook a meal rather than having to eat out. Sometimes on a holiday it becomes a chore to eat pub meals every night so it was great to be able to cook for ourselves. Breakfast was delightful and it is good to have the chance to sit down with other guests and have a good chat. It can make a change from talking amongst ourselves!! We will definitely be back again next year when we will actually be walking the footpath rather than driving it. A lovely place to stay. I've stayed twice on business and there has always been a warm welcome. Comfortable rooms and large and well appointed bathroom. Breakfast is also very tasty. Great welcome, spotlessly clean, large lounge and fully equipped kitchen for guest use, superb breakfast. Definitely to be recommended. My partner and I stayed at Ridgeway Lodge on New Yearâ€™s Eve, on arrival we were greeted with a tour a coffee and a slice of Christmas cake. The room was extremely well presented and very comfortable. The breakfast choice was substantial coffee, tea, cereal, croissants etc. Overall we would rate Ridgeway Lodge very highly and recommend anyone looking to stay in this area to give them a try. This accomadation has a wonderful feel about it as soon as you walk in. the views out of each window are magnificent. The hosts are warm and friendly and cant do enough for you. The rooms are spotless. I would definatly recomend it and stay there again myself. A beautiful home situated in very quiet and peaceful surroundings. The owners, John and Miv, are delightful and most helpful. The small kitchen and eating area for the use of the clients is a bonus. Within easy reach of some good bird watching sites, such as the excellent reserve of College Lake near Tring, Otmoor reserve is near Oxford. We will return to explore wildlife at the gravel pits near Little Marlow. This is the best B&B I have stayed in and would be my first choice every time. Friends came with me on my last visits and their still taking about what great facilities for a B&B. Miv and John make you feel so at home. Internet access is by password. Accessible ground floor shower room. Assistance, Hearing or Seeing dogs allowed only. 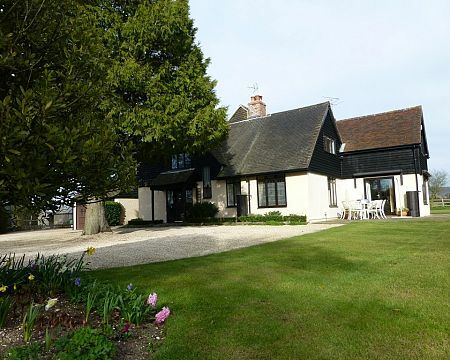 Ridgeway Lodge is on the Upper Icknield Way just a mile from Princes Risborough town centre. Our position in beautiful Chilterns countryside on the The Ridgeway long-distance path is a magnet for cyclists and walkers. Enjoy panoramic views from the house towards the Whiteleaf Cross, West Wycombe, Brush Hill Nature Reserve, Lodge Hill and Loosely Row. The house itself is surrounded by large gardens. The Studio with ensuite shower on the first floor. 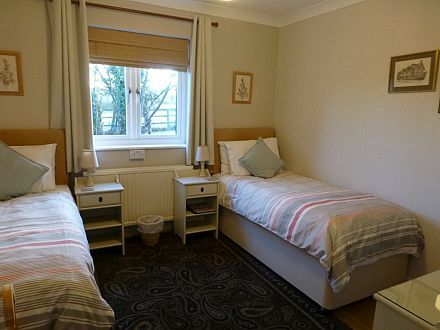 The beds in this light, large room may be arranged either into twin beds or a superking. An extra bed or cot can be provided to create a family room. There are facilities for making tea and coffee; TV, easy chair, desk/dressing table, hair dryer, and a cushioned cane chair. The annexe on the ground floor has two rooms: both twin-bedded rooms, with a TV, hairdryer,separate bedside tables and lamps in each. These rooms share the newly fitted accessible shower room. Tea and coffee making facilities are provided in the annex kitchen. A highchair is also available for toddlers. If you are less able, you will appreciate easy entry over the small step, doors that open wide and floors that are level & hard. For your use there is a dining/breakfast/sitting room, equipped with TV and DVD player. There is also a fully-fitted and equipped kitchen where you can prepare a meal if you want to stay in. There are several restaurants locally, some providing take-aways,including the local Italian. Recently fitted throughout with Bright LED lighting. Ample off-road parking. Your cycle can be stowed securely. Clothes-drying facilities should you be unlucky with the weather! For the protection of our rescue cats we can only accommodate Assistance Dogs.